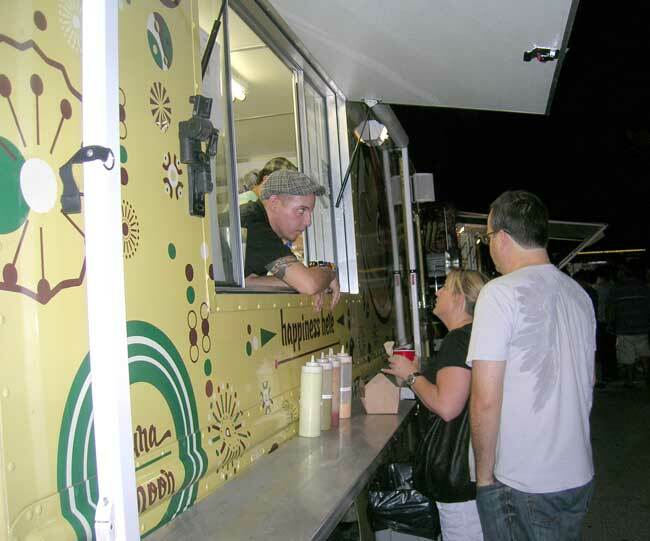 Stop by Mr. Good Stuff’s food truck and feel like a kid all over again. The names on the menu alone, such as I Dream of Winnie and Cheezy-My-Neezy, will make you giggle. On a recent balmy summer night, I stumbled on this jovial, yellow truck with a big image of a smiling boy on its side. The menu includes a variety of ultra-stuffed Lunas (Venezuelan-style, white cornmeal arepas), souped-up hot dogs, Cajun fries with maple syrup for dipping, and other crazy-good concoctions. 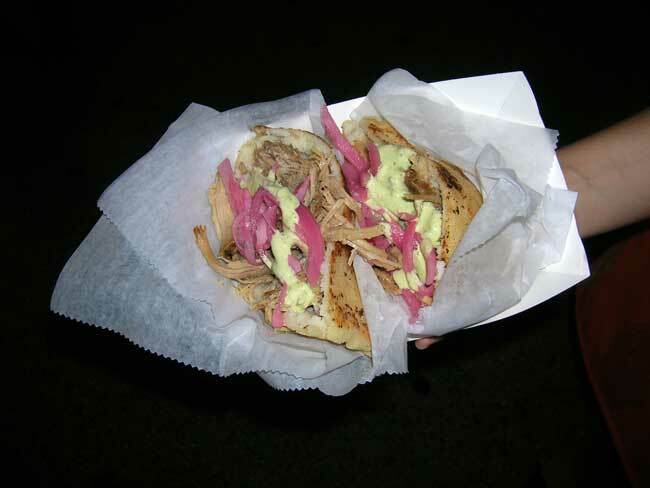 I tried the Mi Cubanita Luna, a big helping of Mojo-infused pulled pork with red pickled onions, and topped it with their delicious cilantro sauce. It was so tasty and filling, like having a whole meal compressed to the size of my hand. I also tried the AWESOME Cheezy-My-Neezy, fritters made from the same arepa dough mixed with three different types of cheese and deep fried until golden. 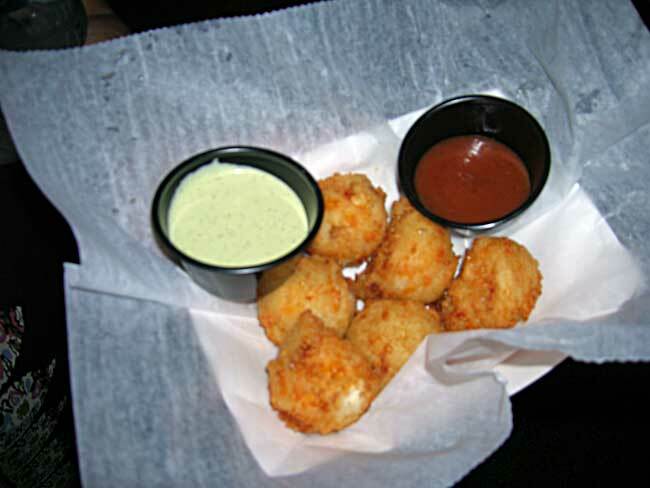 They come served with a spicy guava sauce for dipping. The staff is super friendly and helpful. Though the line of eager customers was long, they took the time to explain menu items in detail, talk about what’s inside each add-on sauce and offered to cut the Luna in half for sharing. But really, you’ll want to get your own. This stuff is too good. Prices range from $5 to $8. let me tell you mr. good stuff’s food truck has the best food hands down… im a fiend. cant get enough of this stuff. i crave it. and the boys that work the truck are the best. i have to admit that we used to go to the food truck events just for a sweet caroline luna and some 4 cheesy my neesy… and i still follow them on facebook to see where they are and whats up with them and see if i can get my luna fix… thanks guys for many a broken diets, and for “well we can cheat today” luckily i have found a solution… well you eat standing so maybe you burn some of the calories off… we have tried i think everything on the menu and the green with envy (stuffed w sweet caroline is the bomb diggity… but there is nothing like my sweet sweet sweet caroline luna… luuuuuunnnnnaaaaaa (in a homer simpson tone) i crave these and cant wait for my next one… keep up the great excelent stupendous work boys… much love … a real LUNAtic.. Lesley (one of your girls from cupcake.love.miami)…. Lesley U, we have enjoyed your comment. Our editor agree’s with you completely! she called Mr. Good Stuff reallllllly goooood! and a must for our friends that follow us. Thanks for sharing your experience with all of us!